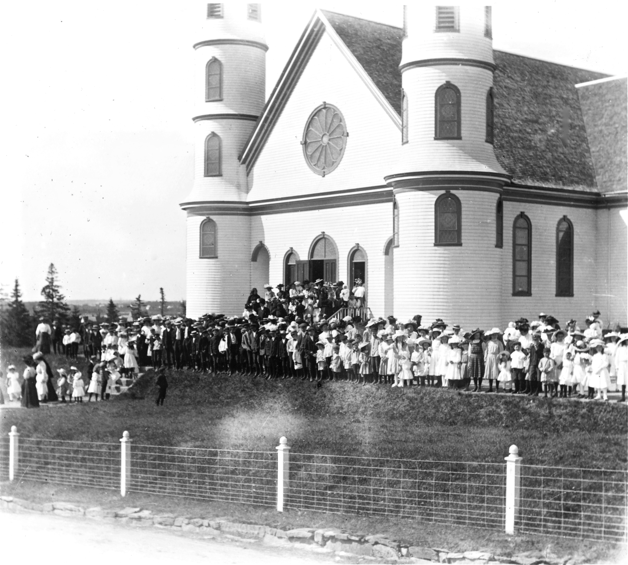 At the end of the nineteenth century several professional photographers were active in rural areas of the Municipality of the District of Argyle. 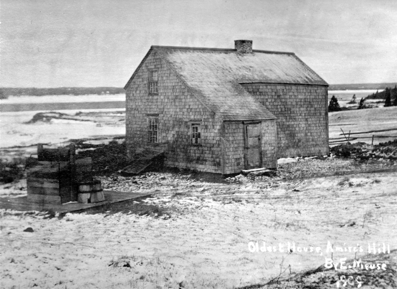 In some cases significant numbers of their prints and glass plate negatives were later collected and preserved at the Argyle Township Court House and Archives (ATCHA). 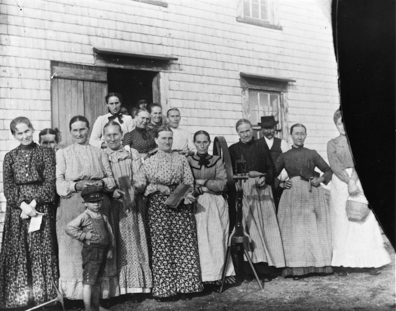 William Day’s essays about these photographers give impressions both of their abilities and of rural life in Yarmouth County during the Edwardian Era. Every essay, a former teacher used to say, should have a beginning, a middle, and an end; and since this essay concerns Eugene Meuse, a photographer from Amirault’s Hill, I have based it on three of his self-portraits. 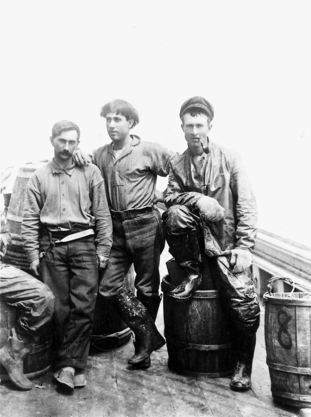 The first shows three young men on a fishing vessel (possibly that of his father, possibly on the Grand Banks). Eugene stands at the centre. He seems happy and so very young! 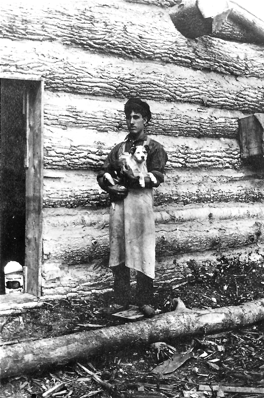 If he were then aged fifteen, this self-portrait would have been taken ca. 1901. Meuse’s landscapes of Amirault’s Hill give a nice sense of the village’s terrain, and the road is sometimes filled with parishioners walking to or from the church. Eugene took this photo ca. 1904 and later printed it on post card stock; the handwritten date on the card is incorrect. Meuse lived at a time when it was usual to move wooden structures around as needs for them changed. Here an old “store à Tiga Moulaison” is being hauled to the property of Gabriel Muise, to be used there as a woodshed. 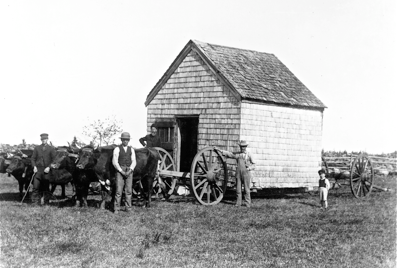 The low-slung vehicle, called a sloven, was well suited for moving heavy loads. Since the young boy at right, Nazaire Muise, was born in 1900, the photograph would have been taken ca. 1904. In about 1905 a carding bee was held at Amirault’s Hill; perhaps Meuse learned of the bee from his mother, Genéviève Muise, who is standing second from the right. The young boy in the front is Nazaire Muise, whom we saw also in the previous photograph. 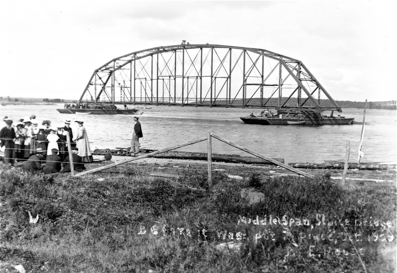 On 4 October 1909, when the new three-span bridge between Sluice Point and Surette’s Island was completed, Meuse recorded the event in a stunning sequence of photographs. This one is entitled “Middle Span, Sluice Bridge, Before it was put in place, Oct. 1909, By E. Meuse.” The span is 300 feet long. As he matured, Meuse’s interests began to shift from photography to carpentry, mechanical projects, and inventions. 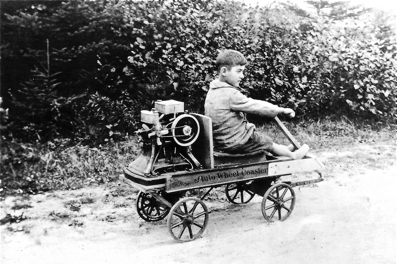 In 1911 he patented a design for a crank-operated can opener; and here he has modified an Auto Wheel Coaster wagon to make it self-propelled. If the driver is Eugene’s oldest son, the photograph would have been taken ca. 1919. 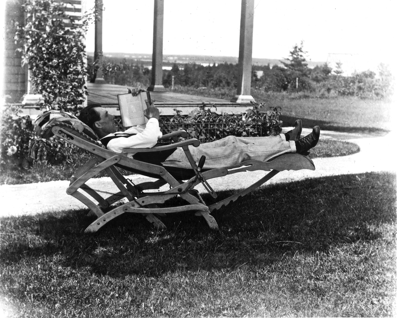 A final self-portrait shows Eugene Meuse relaxing on a wooden recliner, which may have been of his own design. In 1928 Meuse began work on a large grandfather’s clock for which he intended to make the mahogany case and a clock mechanism to display the time of day, day of month, and lunar phase. Although the clockworks were still unfinished (in his opinion) when Eugene died in 1972, the mahogany case is on display at the Yarmouth County Museum. I thank Peter Crowell, archivist at the Argyle Township Court House and Archives (ATCHA), for providing access to photographs by, and archival material concerning, Eugene Meuse. The photographs I’ve shown are copyrighted by ATCHA. 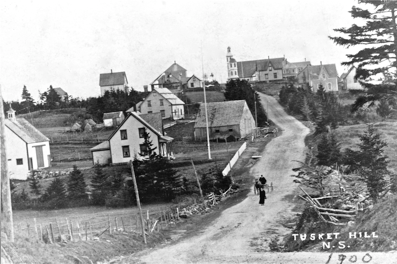 A version of this essay appeared in the Yarmouth County Historical Society Historigram on pp. 7–8 of vol. 14, no. 9, Oct. 2014 and vol. 15, no. 1, Feb. 2015. More photographs by Eugene Meuse may be found in Peter Crowell’s article, “The Eugene Meuse Photographic Collection,” in The Argus, vol. 5, no. 4, Winter 1993, pp. 33–38. Susan Young has reported a fascinating investigation of the carding bee photograph (P1993-303pf, ATCHA) in “Eugene Meuse’s Carding Bee: Families and Old Photographs,” in The Argus, vol. 8, no. 3, Fall 1996, pp. 20–32.